GraphQL is an alternative to REST endpoints for handling queries and database updates and in this Write Stuff article Igor Ribeiro Lima shows how you can use it with MongoDB and web applications. GraphQL itself is a way to define a contract of what is provided by the server to a web application. GraphQL tries to improve how clients communicate with remote systems. It comes from a simple idea – instead of defining the structure of responses on the server, the client is given the flexibility to define what it wants in response to its queries. In this article we'll show you everything you need to get going with GraphQL. As we know, a REST API typically delivers all the data a client UI might need about a resource and leaves it up to the client to extract the bits of data it actually wants to show. If that data is not a resource it already has, then the client needs to go off to the server and request some more data from another URL. Over time, the link between front-end applications and back-end servers can become pretty rigid. As data gets more complex in structure, it gets harder and slower to query with traditional tools. Instead, with GraphQL, the UI gets the data it needs in a form that is useful for the UI. The core idea is that the code knows that the data that it needs are on the client, not the server. With GraphQL as an abstraction layer, we hide the complications of web services and let back-end developers create a menu of both available data structures and items available to retrieve (and how to retrieve them). Doing so allows the front-end application - and its developers - the ability to select from the items on the menu as they need. The front-end application doesn't need to worry about new items being added to the menu or where the data for that menu is coming from; that's a task for the GraphQL server. GraphQL is a query language that allows the client to describe the data it needs and its shape by providing a common interface for client and server. It has been designed with a flexible syntax that makes building client applications easier. This interface, between the client and the server, also makes retrieving data and manipulations more efficient because it encourages using only the data needed, rather than retrieving a fixed set of data. For instance, a Todo application may have a lot of information for each todo but let's use GraphQL to request a title and an id from a GraphQL server. As you can see, the query defines the format of the response. What the client asks for is what the server will use to return results using the query as a template for JSON objects. GraphQL does not mandate the use of a particular language – JAVA, Ruby and many others have implementations. GraphQL itself is independent of language and protocol being just a specification for queries and responses passed between a client and a server. This is some sample data for us to work with for now. Based on that sample data, let's define a type for each attribute: id, title and completed. Strings and boolean are obvious types while the ID type is a content-agnostic type for carrying unique IDs. Now we have defined the todo object and described the types for the three fields. The next step is that we need to show how to resolve a query by returning the data through a query type. The resolver is defined in a resolve property and is a function that returns an array of todos. That data is an array in memory, and so the return is a synchronous operation. In case we need to do any asynchronous operations, such as say retrieving data from a database, we can make use of a promise which can wrap the asynchronous operations for us. To create a promise, we need to create an executor. An executor is a function object with two arguments resolve and reject. The first argument fulfills the promise; the second argument rejects it. At the end of the operation, depending on a success or failure case; either one or another should be called. In all, this defines a simple schema with one type and a list of todos - of which each elements has three fields - that resolves to a value retrieved from the array. Second, we need to serve the result of a query against that type schema. We'll want the express, express-graphql and graphql packages. You don't need to use cURL. It's just a simpler way to retrieve data, rather than trying to craft queries in the browser. If your system doesn't have cURL, binaries can be downloaded from the cURL website. It's a great tool to have at hand. The schema advertised by the server doesn't define how the data is stored. It only describes an API the client can make use of. Getting the data to fulfill the client's requests is an implementation detail of the server. GraphQL handles adding or changing data as a side-effect of a query. Any operation that intends to have side-effects is called a mutation. Therefore, to define a mutation is very similar to defining a query. The difference is that your resolve method can act on the data before returning results. 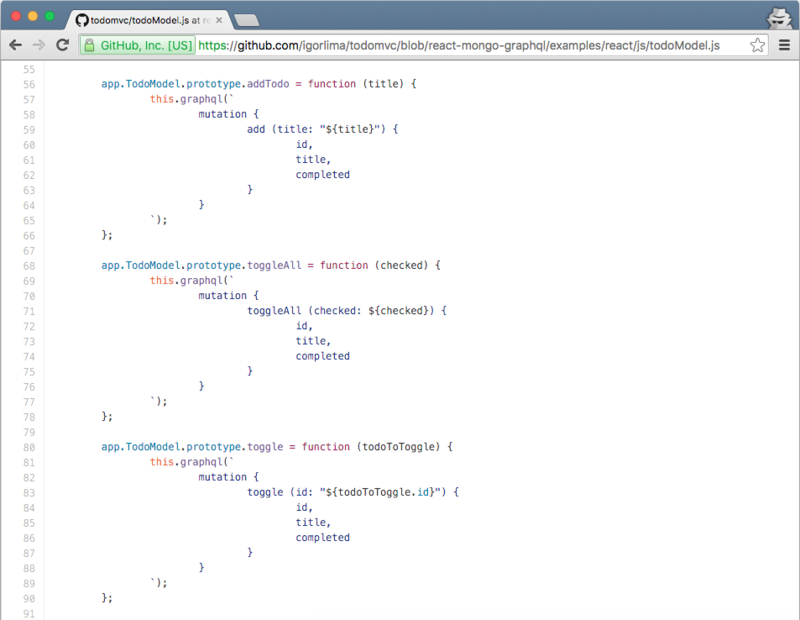 This is where we can also make use of GraphQL arguments. Like a query, mutations also return typed values. The idea is that if something was modified as part of a mutation, then the mutation also returns whatever was modified. The Add mutation takes a title string and the resolve method for the mutation uses that title to create a new todo item which it then tries to save using a promise. If successfully saved, the newly created todo is returned. By the end of the request, theNumber field should have the value of 2.
mutations for manipulating (create, update, delete) data. The next step is to show how to plug that into a database. Remember the interesting thing about GraphQL is that it makes no assumptions how the data is stored. It does not matter if data comes from memory or any sort of database. The function resolve defined in the schema is the function that will retrieve data from wherever it resides. Let's recall what we did for a query in the preceding code. We'll assume the database connection is already open, and create a Mongoose model to back our todo items. Because a database may take some time to complete a query or queries, the GraphQL.js server accepts results or promises to return results. The promise here is called with two functions, resolve and reject, passed into it. Within its code it does a find and in the find's callback function, if there was an error, it calls the promise's reject function. If all was well, it calls the promise's resolve function with the results. 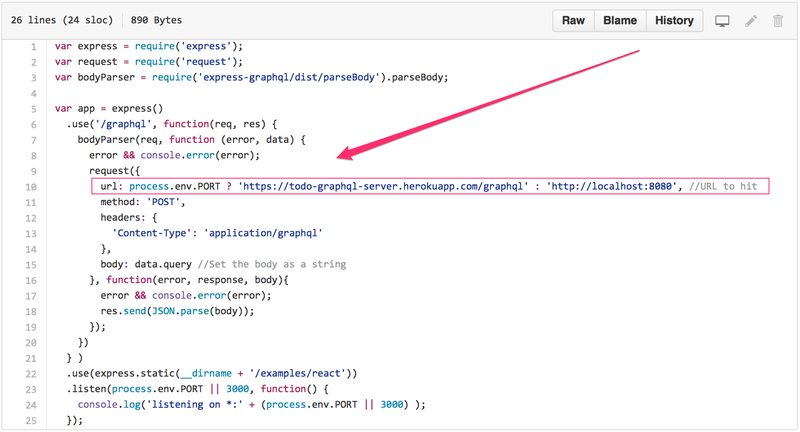 Inside the GraphQL server that rejection or resolution will be picked up and the appropriate results returned. It's up to the client to describe the data it needs. Here we ask for id, title and omit completed. The response format is described in the query and defined by the client instead of the server. In the full version of our example, we have added more other mutations like: toggle, toggleAll, destroy, clearCompleted and save. One thing to notice is that we can also pass arguments. Any query or mutation can accept arguments - to create arguments is quite simple and they can be picked up and used in the resolve function to shape how the query or mutation acts. React components implement a render() method that takes input data and returns what to display. 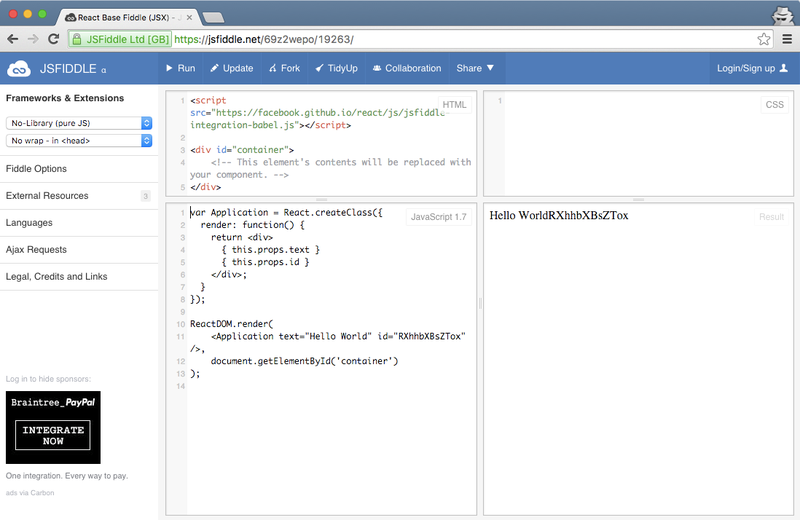 This example uses the XML-like syntax called JSX. Note that JSX is option and isn't required by React, but JSX is very useful. If we want to get at input data passed into the component, it can be accessed within the render() method through this.props. First of all we need to get a server up and running to receive our GraphQL queries from the Todo List app. The server core has already been written above. You must have Node v4.0.0 or above. The server code uses ES2015 features that are not supported by older versions. In case you are not a big fan of the command line console, just hit http://localhost:8080 in the browser and start writing and testing GraphQL queries by using an in-browser IDE. Head to http://localhost:3000 to see the running application. Apart from adding the express-graphql package to the application, this code has two major changes in comparison to the original version. Those changes happen inside the examples/react/js directory. The .jsx files are untouched but the file examples/react/js/todoModel.js is changed so it has the information it needs to contact a local GraphQL server. In the images below you can see how the ToDoModel functions have been changed - the exact changes can be viewed on Github. That's all. Although GraphQL is relatively new, it does show a useful way of allowing client applications to take the driving seat in what data they retrieve and how they manipulate it, rather than having to adapt to what data a server's API offers. It's a powerful way to offer up the data from your database while retaining control.